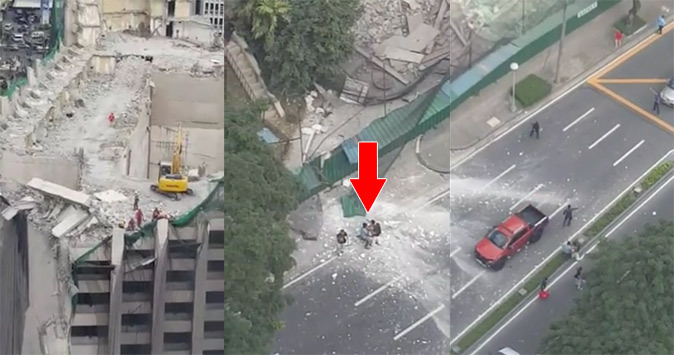 An Australian woman was hit and injured by debris during the demolition of the old Mandarin Oriental Hotel in Makati on Friday, November 27. Authorities identified the victim as Suzanne Mellor. The 52-year-old foreigner was walking along Paseo de Roxas around 12:40 p.m when she was hit by slab coming from the building. She suffered a leg fracture and was complaining of dizziness while receiving treatment at Makati Medical Center, according to reports. A Toyota Fortuner driven by Deborah Escober was also damaged by pieces of cement. She and her husband were also examined at the hospital. In an official statement, Ayala Hotels Inc. said: “We regret that this incident happened and we assure the public that we are continuously taking measures to ensure the safety in the surrounding area and the well-being of all people affected." "At the same time, we have asked the contractor on site, JLC Construction, to provide a full account of the incident," the statement read.